Of all President Trump's cabinet picks, it would seem that Betsy DeVos -- the White House's new education secretary -- faced some of the biggest hurdles in being confirmed for her position. And as of late, the controversy surrounding one of the president's most contentious cabinet picks appears not to be letting up. The education secretary has been receiving backlash the past few days for a political cartoon published by conservative artist Glenn McCoy on Monday. 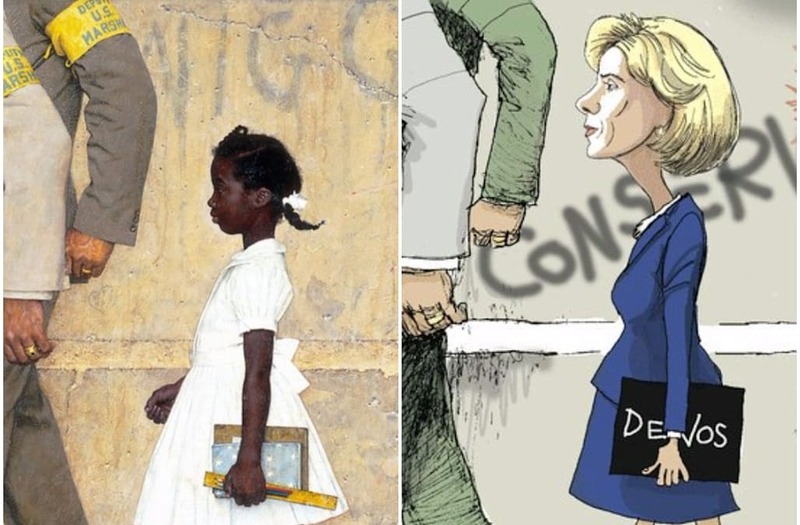 Since its publication in an Illinois outlet, the Belleville News-Democrat, the photo has gone viral, igniting users on Twitter, including Chelsea Clinton, who say the photo reimagines man Rockwell's 1964 painting "The Problem We All Live With," which depicted a young Ruby Bridges in New Orleans' 1960 desegregation crisis. Chelsea Clinton rebuked the editorial cartoon's comparison on Twitter Tuesday night. And others joined Clinton in outage by the comparison. @jbouie *Ruby Bridges wanted an equal public education; #BetsyDeVos wants all our children's publ education tax 💰💰& transfer to the 1% RICH! @primediscussion She's no Ruby Bridges. The conflation is horrible and insulting. @saintwarrick @kswills @primediscussion Devos is basically the same age as Ruby Bridges is NOW & treated as a child. Makes my stomach turn. President Trump nominated DeVos to the post in November, calling her "a brilliant and passionate education advocate." But DeVos' performance before a nomination committee in January caused her to make headlines for all of the wrong reasons. After two Republican senators said they could not back DeVos, the vote to nominate her was tied at 50-50. Still, following a marathon of objections from Democrats that exceeded 24 hours, DeVos was confirmed education secretary early February after Vice-President Mike Pence casted the deciding vote to confirm the educational choice activist from Michigan.